The public is being advised to take shelter from the sun, as the joint warning from the NHS, Public Health England and the Met Office says there is a 90% probability of heatwave conditions until 09:00 BST on Friday. The Met Office expects temperatures to remain in the low 30s throughout Tuesday, climbing to a likely 33C on Wednesday, while Thursday and Friday could see 37C. Temperatures above 34C "can't be ruled out", it says. The hottest July day on record in the UK was 1 July 2015, when the mercury hit 36.7C at Heathrow. Northern Ireland, Scotland, Wales and north-west England have seen cooler temperatures and even some showers on Tuesday. But this hasn't stopped Moray Council in Scotland has to offer thousands of homes free bottled water as private water supplies ran dry. Meanwhile, several places in England have gone without significant rainfall for 54 consecutive days. The longest run with no rain at all this summer is 48 days at Brooms Barn, near Bury St Edmunds. The dry spell has led to a hosepipe ban, closed canals and revealed ancient hidden landscapes. Rivers and streams have dried up in England, leaving thousands of fish to be rescued by the Environment Agency. The National Farmers' Union has warned of crops "parched to the bone" and livestock farmers resorting to using winter rations, as grass has stopped growing. 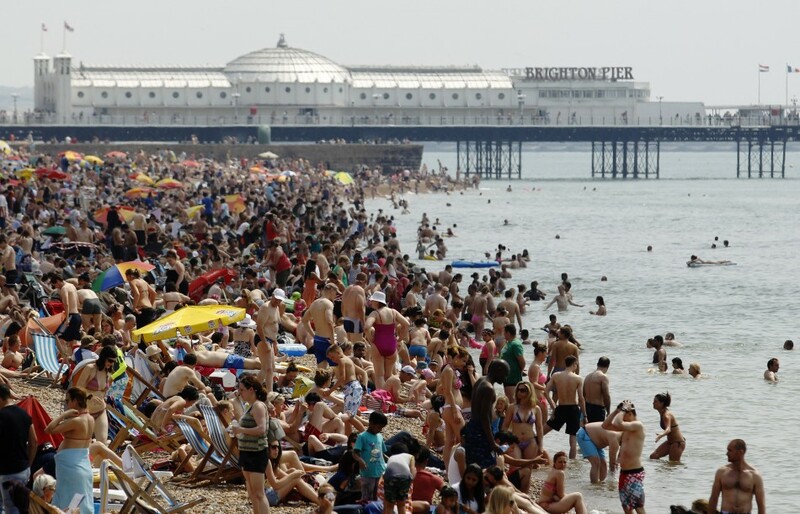 The NHS says the hot weather could increase risks to vulnerable patients, such as older people, babies and young children, and people with serious chronic conditions. Dr Nick Scriven, president of the Society for Acute Medicine, said his hospital unit in Halifax had as many patients yesterday as it would on a winter's day. "Admission levels are high, and as a personal example, our unit had winter levels of activity yesterday with a lot of respiratory symptoms, presumably due to air quality," he said.